In 2017 we invite you to Wroclaw on June 17th. 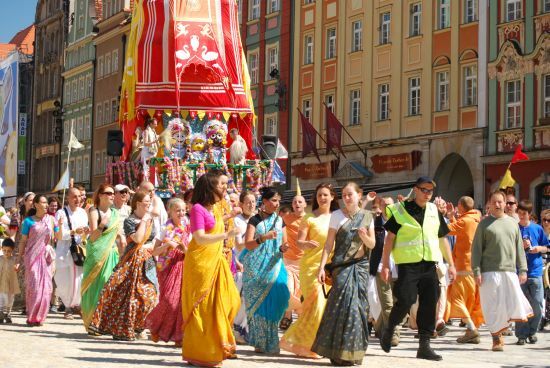 14.30 – 16.30 Pulling the Ratha Yatra cart by all the participants around Old Town Square with stops for the vegetarian food distribution. 16.30 – 20.30 Plac Solny: Stage program along with serving vegetarian meal in the tents next to the stage. 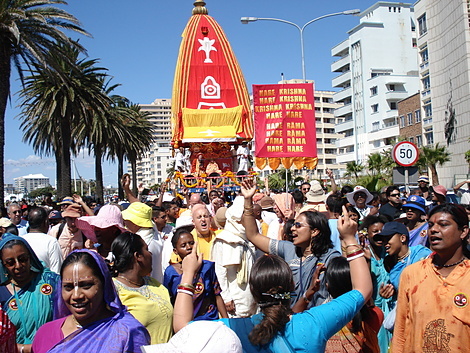 Ratha Yatra Festival, also known as The Festival of Chariots, has centuries long tradition in India. Traditionally, this great religious and cultural event takes place in June. This is when hundreds of thousands of pilgrims arrive at the famous city of Jagannath Puri in the state of Orissa. More and more people from Europe and other continents also participate in this well-known and enjoyed festival. The city of Jagannath Puri (East India) is famous for its ancient temple and Deities there presiding. They are the unusually shaped figures of Sh ri Krishna as Lord Jagannath (Master of Universe), His brother Baladev and Their sister Subhadra. Legend has it that the figures were made by the mythical heavenly sculptor Vishvakarma on the request of Indradyumna, the king of Orissa. The artist stipulated that no one could see the figures until they had been completed. The impatient king broke that agreement though and entered Vishvakarma’s workshop.At that moment the sculptor disappeared, leaving the roughly hewn chunks of wood. King Indradyumna, a great devotee of Krishna, requested the unfinished figures to be painted and placed them in a temple specially built for them. Over the millennia the Deities have been worshipped in that form, until the present day. The event is entirely financed with funds and donations raised from individual sponsors and institutions. All interested are invited to participate in creating and organizing this special event, and encouraged to support the Festival financially. This year we invite you on June 11th. Rathayatra is celebrated by devotees of Lord Krishna all over the world after being introduced to the west in 1967 in San Franscisco by His Divine Grace A.C. Bhaktivedanta Swami Prabhupada and his first American disciples.